What’s best when it comes to caring for outdoor succulents? I’ve learned a few important tips for keeping these popular plants healthy and vibrant all season long! While I was at a local garden centre back in May, I was drawn to the section of tiny succulent plants and couldn’t leave without picking up a bunch. At first I shoved all nine in a wooden crate for my outdoor brunch tablescape, but it didn’t take long for the plants to outgrow their temporary living quarters. Eventually, I was able to find the perfect pot to transfer them into, and I’m happy to report they’re thriving in their new home located on our front porch. 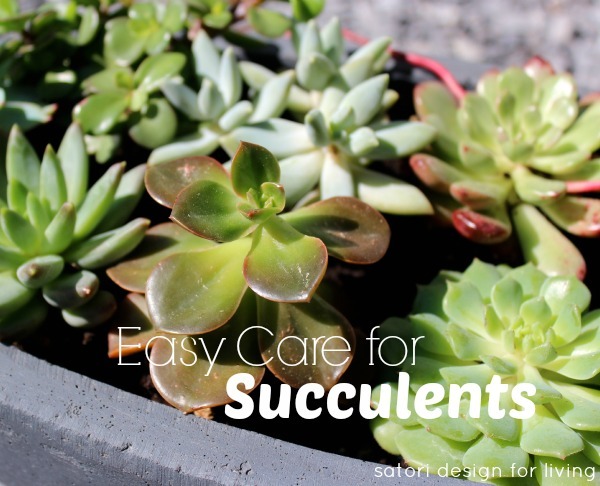 I find succulents to be one of the easiest plants to grow indoors, but there are a few tips I’ve learned along the way to make sure they stay happy and healthy outside as well. I’m definitely no expert when it comes to succulents (or any plant for that matter), but so far I must be doing something right since these cutie-patootie plants are alive and well. Succulents don’t require a lot of water. I find it’s best to keep these plants out of the rain if possible so the amount of water they receive every week is controlled. The most common problem with succulents is rot. 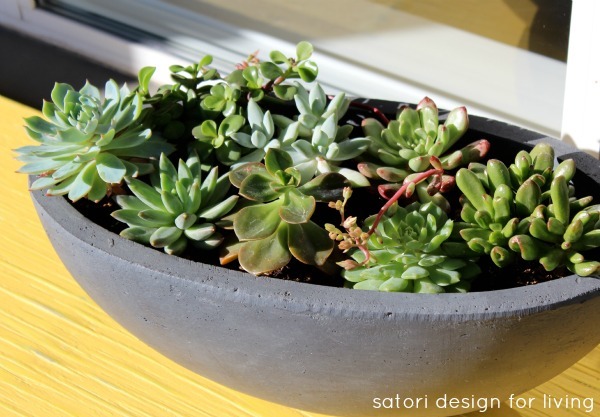 So, how often should you water succulents? Depending on the outdoor temperature, I give mine a good watering once a week throughout the summer allowing the soil to dry out in between. The closer we get to fall I plan on extending the amount of time in between. Succulents don’t like their roots sitting in water for long periods of time. 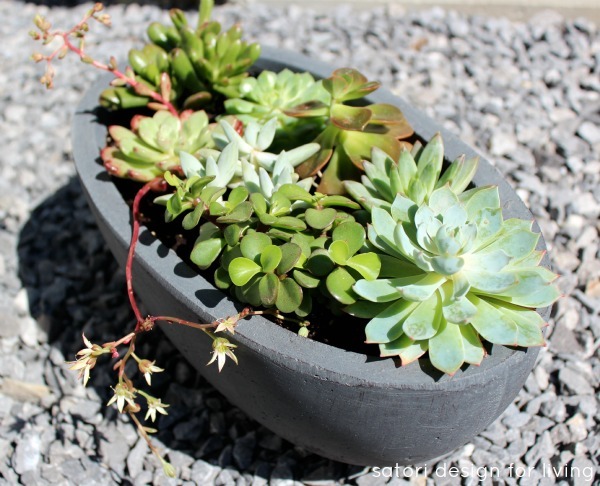 A good succulent potting soil with vermiculite allows for adequate drainage, as does rocks or pebbles at the bottom of a pot. If you plan on planting succulents in a bed instead of a container, mix a good amount of sand in the soil for proper drainage. 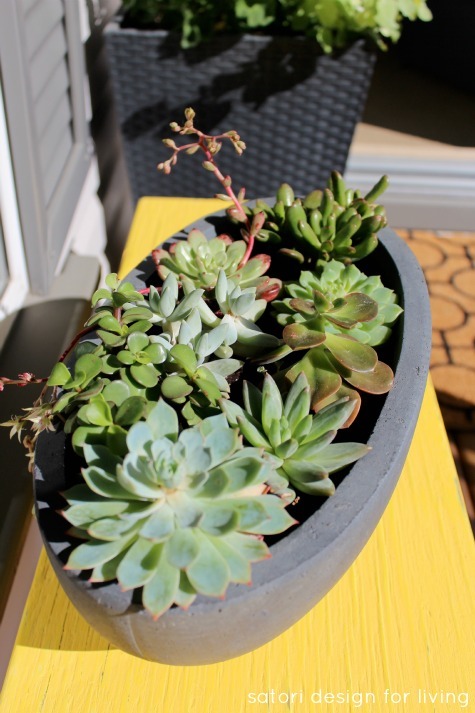 Keep succulents out of direct intense sunlight. These plants require a lot of light, but extreme sun may burn the leaves turning them brown or spotted. A perfect spot outdoors is an area that receives a good amount of sunlight (6-8 hours) and bit of shade during the intense heat of a summer day. A sign that your plants aren’t getting enough sunlight is if they start to stretch out with a lot of space between their leaves. Have any other tips for caring for outdoor succulents? What has worked well or not so well? I’d love to know. 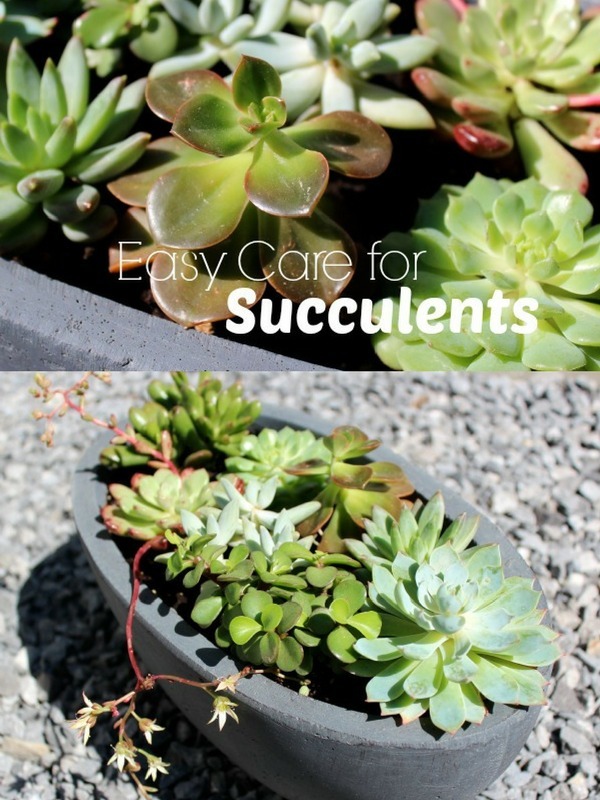 Pin these succulent care tips for later! 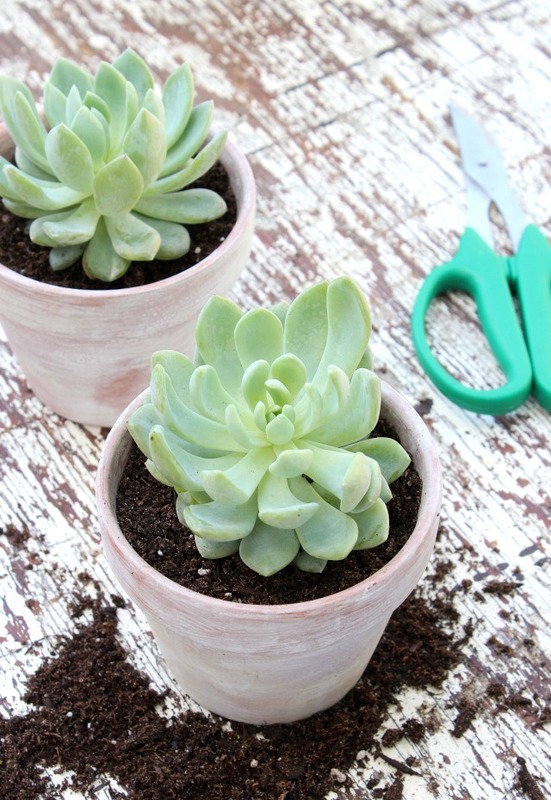 Click here to see these cute mini succulent pots plus more potting tips! They look beautiful! Thanks for the tips, I love succulents! Thanks Laurie. They’re just so darn cute, aren’t they! Great tips, Shauna! I created a succulent terrarium this year, and somehow… two of my succulents have decided to give up on trying. I am totally aghast at their lack of effort, but perhaps it’s because I haven’t been caring for them properly! I have two indoor succulent plants that have been going strong for quite a while. One is called a money tree so I definitely don’t want that one to die! I had a terrarium that did really well all fall and winter and started to go downhill in the summer. I think it got too warm (I had a fern inside). Good luck with the rest of them! I love succulents but mine have not worked out lately. Yours look gorgeous, so obviously you have the right touch! Probably too much water. Before I repotted mine some were going down hill because they were in the rain too much. Put them under my covered front porch and they’re looking lovely (so far!). Thanks for the tips Shauna! I didn’t know that they don’t like the hot sun, I’ll have to remember that… I’ve got it Pinned though so I won’t forget! Thanks again and your succulents look great in that container!! Succulents are my favorite indoor plants! I just can’t seem to keep anything alive. Love this post. Gives me hope that I could actually do it. These look gorgeous. Every year I think I should try succulents, but I haven’t got around to it yet… It just dawned on me that they would be perfect for the balcony at the condo because they don’t need regular watering! That would be perfect, plus they’d suit the look of your condo. I plan on bringing mine inside once fall hits. Hope they last all summer long! Oh, I love how succulents look, but I literally kill everything I touch… I heard that they are pretty low maintenance though, so I might give them a try. Thanks for the tips! I might have to give them a try, thanks Shauna! Super cute! I think direct sun is good when it’s not so hot outside. Move them for July and August and see about later on. Do you bring them inside for the winter? I picked the pot up at Winners. It took me a while to find it, and I walked in one day and knew it was perfect. Glad I held out! I’m new to gardening, I’m so overwhelmed. Thanks for the tip.